For cookie making, late night shopping, tree picking, prepping and decorating, outdoor light hanging, party planning, schedule keeping, kids Christmas concerts and plays, family visits, card mailing, extra post office visiting, letters and visits to and from Santa, advent readings and candle lightings, caroling, gift wrapping and everything else in between. Chances are you're probably already running the Christmas race, or so it feels sometimes. Every year I find myself simultaneously not wanting it to feel like a crazy race, but realizing that there is so much we hope to fit into such a short period of time that how can we possibly expect it to feel any other way? I also find myself wondering if Christmas is supposed to be a holiday intended to celebrate and remember something profoundly spiritual, how do we end up so busy that we have no time to be reflective, contemplative or prayerful-- the keys to digging deeper spiritually. I find myself desiring to be present, and wanting to meditate on Christ's coming-- the real reason for the celebration--but inevitably become distracted by all of the other hoopla. Good hoopla. Fun hoopla. But hoopla nonetheless. I feel like Im straddling two different worlds. The Christmas our culture has created and the Christmas that should be a reminder and celebration of Christ's coming to the world. So what do we do? How can we try to stay focused, be reflective and not get to the end of the month feeling tired and spiritually drained, but with hearts that are grateful and souls that feel nourished? I think the answer is to stop. Stop some of the running. Stop some of the shopping. Stop some of the commitments outside of our homes to stay home and sing Christmas carols around the tree (something we wound up doing on a whim last year and that Ava has been asking to do again!). We must stop running so that we can start being. Being still. Being silent. Being reflective. Just being with one another sometimes. I'm not saying I'm good at this or that I even get it right all of the time. We have our fair share of kid commitments, church commitments and all sorts of other craziness in-between. But, in the midst of it all I'm trying to be intentional through advent readings (my own and as a family), journaling (I bought a red journal a couple of years ago that I jot thoughts and notes in as we move through the Christmas season), making time to read Nativity stories with the kids and even watch fun movies. I'm trying again to stay focused in the midst of the business. I'm trying not to go so fast through it all. I'm trying to slow my pace and my heart. I'm trying to not overcommit. I'm trying to be very intentional about what I want to do with the kids when and where and how. 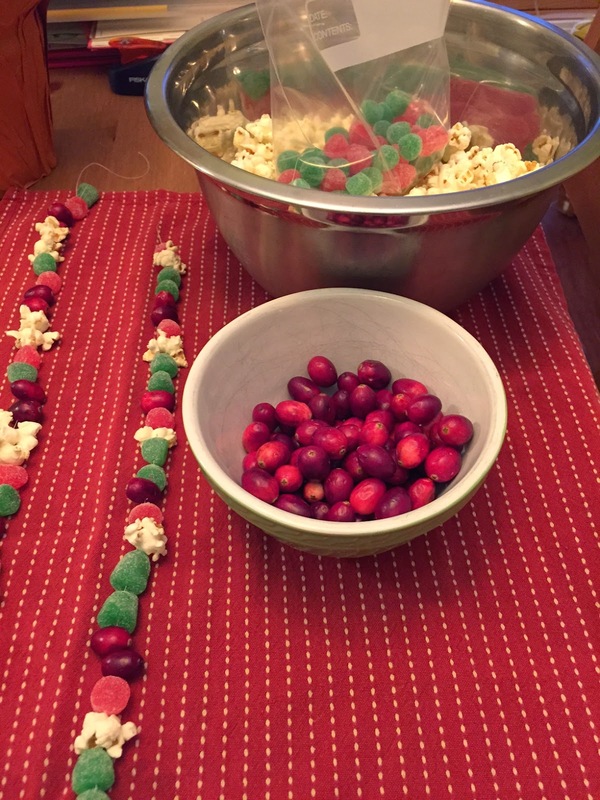 I'm trying to make much of the little- the little moments making garland at our kitchen table where the needle and thread become unexpectedly sticky and we all laugh at what a mess it is to try to string popcorn, cranberries and gumdrops. It looked so easy in the pictures! I'm trying to make much of our conversations. The ones where we talk about the importance of giving to others. I'm trying to teach them that sometimes giving a gift is even more fun than receiving one (or at least just as much fun in their young worlds!). I've helped them pick out some gifts for each other and gave them each a box to hide their special treasures in under their beds. I will try to make much of the cookie making moments to come (as messy as they are sure to be! ), and the gift wrapping extravaganzaas. I vow to wrap with a heart of gratitude for the abundant blessings that we have and say thank you for the ability to buy each of the many gifts for friends and family members. I'm trying to make much of the little moments that we try to include daily where we light a candle and read a portion of scripture and a reminder of Jesus' coming from one of several Bible storybooks that we have. I'm trying to make much of the sweet little nativity set we picked up at Hobby Lobby. I wanted one that the girls could set up and that I would not be overly sad about if something got broke . I settled on this one for $29, and then splurged on the barn/stable piece for another $20. I won't lie and say everything was silent night and joyfully bright as we set that up though! The girls fought over who would put baby Jesus in the nativity scene until I had to take baby Jesus away. "Mommy is putting baby Jesus in the nativity scene!" I said sternly not knowing how else to end the argument as I tightly held onto baby Jesus lest a fight of epic proportions ensued. But...when they're not fighting over the pieces, or who will get to lay the straw down ("Girls! There is enough straw for everyone to put some in the manger! I swear!") I hope they take an extra moment to stare at the angel, and the baby in the manger and Mary's head bowed low in prayer. I hope that image is the one that remains in their minds and in their hearts for a long time to come. I hope it reminds them, eventually, to take a moment to bow their own heads and thank Jesus for coming and for loving them. 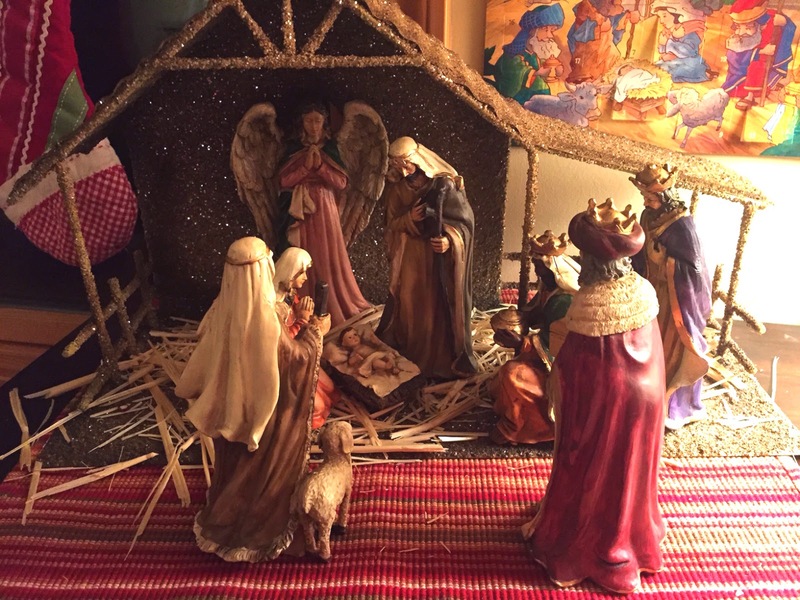 We're trying to make much more of Jesus in our house than the guy in the big red suit-- the world makes enough noise about him that he is sure not to ever get lost in the celebrations. But Jesus...I fear Jesus gets lost in the noise sometimes and that makes this momma sad. So we read lots of stories about the stable, and I try to be intentional about many of my decorations. The girls still think Santa is real. Or so I think they do. And we even have a roaming Elf on the Shelf that was gifted to us several years ago. Yes, the girls think she flies back to Santa every night to report on life in the Littlewood household. We leave cookies out and a couple of their presents will say "From Santa". Sometimes I feel a little conflicted about it all, but we're trying to have some fun with them while keeping the focus on the real reason for celebration. I never believed in Santa as a kid and while I understand where my parents where coming from I do think there is some innocent fun to be had with the whole thing. I was the one going up to the 5 and 6 year old kids telling them boldly, "Santa isn't real you idiot! Your parents bring all of the presents!" Um, yeah. That was super, duper Christian of me wasn't it?!! Sorry if you were one of those kids ): I wish I could take that back! All that to say...I'm trying, in this busy season of parenting, in a culture that is always on the move, to find ways to be slower and more present. This morning while Aubrey is in play school for two hours I felt a restlessness and an urge to go run, run, run. There is wrapping paper to buy and dinner to make, and really good sales to hit up! But instead I've grabbed my computer, my Bible, a great book on parenting, my journal and I'm sitting. Quietly. In the church foyer where I dropped Aubrey off. The only thing I can hear is the sound of the ventilation system and the lack of distraction feels very good for my soul. I'm saying a prayer of thanks for the moment and asking God to help me be intentional as I move through the rest of the day and all that it holds (which is quite a lot!). I've prayed that these words would find their ways to the right hearts and that they would somehow be an encouragement to you. I'm praying that you and I would both have a fun and celebratory Christmas that is strengthened by some quiet moments and purposeful prayer. I hope to get around to blogging at least one more time before Christmas, but I'm not making any promises (; I might be too busy singing Christmas carols with my kids or sitting in a quiet corner somewhere! I hear you! We have something every night until Monday. All fun things- the Christmas concerts, a big family reunion, etc, and then we leave to visit Keith's family on Wednesday. We come back to Keith's fortieth birthday and then Luke's birthday too! I will be hibernating in January.